At Backyard Greenhouses we offer over 8,000 greenhouse models and sizes to choose from. Selections include free standing models, lean-to home attached models, custom and commercial selections in twinwall polycarbonate, fivewall polycarbonate, single or double tempered glass greenhouses. 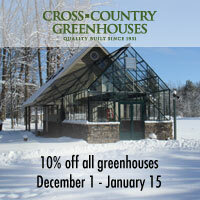 All greenhouses must be shipped out by February 28, 2011. We cannot delay production of a greenhouse for shipping purposes, and greenhouses cannot be stored for any reason.